Thrifty and Frugal Living: Newman's Own Organics Review and Giveaway! I am sure that all of you have heard of Paul Newman's company: Newman's Own, but did you know that his daughter Nell has her own line of food products? 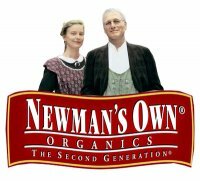 Newman's Own Organics was started as a division of Newman's Own and became it's own separate company in 2001. All of the products in the line are certified organic by Oregon Tilith. *Pretzels- I was sent the Honey Wheat Mini Pretzels, the Salt and Pepper Pretzels and the Pretzel Rods. My favorite were the Honey Wheat Mini Pretzels. They had the perfect balance of honey, wheat and salt. They do taste a little different from regular pretzels, but I actually like them better. They have a more homemade taste. The Salt and Pepper Pretzels were very different. I like the taste of them, but could not eat more than a few at a time due to the pepper (which is probably a good thing). The Pretzel Rods were also delicious. I love that none of them were over-salted like some pretzels can be. *Fig Newman's- I love fig cookies, so I knew I would love these. I was sent the Low Fat and Fat Free Fig Newman's. Both of these tasted the same to me: yummy. They are slightly bigger than other fig cookies I have had. The crust is light and flaky and the fig filling is sweet and delicious. If you like fig cookies, you will love these. *Dried Fruit- I was sent the Raisins and the Berry Blend to try. I loved both of these. They are great to sprinkle into cereal, oatmeal or grits in the morning. I also like to eat them straight out of the bag. While these fruits are dried, they are not over-dried. They are still very moist and a little messy from the juices. Yum. *Soy Crisps- I received the White Cheddar and Cinnamon Sugar Soy Crisps. These are made with organic soy and organic rice. Honestly, they taste just like regular rice cakes (which I happen to like). I liked the Cinnamon Sugar ones the best. They are a nice, sweet treat without a lot of calories. The White Cheddar Soy Crisps were very savory. They are good, but I can only eat a few at a time and they did leave a little bit of an aftertaste. *Licorice- I was sent all four flavors of licorice: black, strawberry, pomegranate and tangerine. These are delicious! They are a harder, chewy licorice which means you are satisfied with only one or two pieces. My favorite are the pomegranate and tangerine. The strawberry is also great. I don't like black licorice, so I had to rely on a friend to tell me that they are fantastic too. *Mints- I received all four flavors of the mints: Cinnamon, Ginger, Peppermint and Wintergreen. My favorite were the Hot Cinnamon Mints. All of the mints are hard mints that look as though they are hand cut. They are all very flavorful and make great after dinner mints. *Champion Chip Cookies- I received the Chocolate Chip, Double Chocolate Mint Chip and Chocolate Chocolate Chip Cookies. My favorite were the regular Chocolate Chip. I am a traditionalist when it comes to chocolate chip cookies. All three flavors were great though. These cookies are small, round cookies in a bag versus a plastic container. The design is great for smaller kids. The cookies would fit perfect in their hands and they are easier to grab. Of course, they work out well for adults too. *Newman-O's and Ginger-O's- These cookies are Newman's Own Organics version of Oreos. They taste just as good (if not better) and come in interesting flavors. I received the Hint O'Mint, Chocolate Cremes and the Ginger-O's. The Hint O'Mint were my favorite. They have the perfect combination of mint creme sandwiched in between chocolate cookies. Yummy! I have already mentioned that ginger is not really my thing, but I actually liked the Ginger-O's. I just could not eat more than two at a time. The Chocolate Cremes were also delicious. PET PRODUCTS - Newman's Own Organics also has a pet line and they sent me some treats for my Chihuahua Tequila. We were sent the small size Cheese Dog Treats and the Chicken and Rice Recipe Training Treats. The Cheese dog treats are shaped in adorable little hearts and look like healthy homemade treats. The Chicken and Rice Recipe training treats are chewy brown sticks. Tequila loves them both. His favorite are the Chicken and Rice Recipe sticks. They disappear quick! I should mention that these are the first and really the only organic treats my dog has ever liked. We have bought him some in the past that he would not touch at all. To Summarize: Newman's Own Organics Rocks! Did I mention that they also donate a lot of money to charity? Paul Newman even founded his own charity group: Hole in the Wall Camps. Visit the Newman's Own Organics website and click where it says "Retailers and Stores" to find a retailer near you. The Mandatory Entry must be completed, or you will not be eligible to win. Please leave a separate comment for each extra entry. If you do not leave separate comments, it will count as only 1 entry. Make sure you leave your e-mail address, or have one visible in your google profile. Giveaway ends 12/20/10 at 9pm EST. Giveaway is for US residents only. No P.O. Boxes. Winner will be chosen randomly. Winner will be contacted via e-mail and then will have 48 hours to respond before a new winner will be chosen. I would like to try the balsamic vinegar and olive oil. I would LOVE to try the chocolate cups... yum!! thanks for the great giveaways!! I follow Newman's on FB! They have two new organic dried fruits that I would like to try - the apples and the berry blend. I would love to try their dryed fruit yum! I'd like to try their honey wheat pretzels. I would love to try the Fig Newmans. I would love to try the Cinnamon Graham alphabet cookies! i would like to try Newman’s Special Blend coffee. I'd love to try the Butter Flavored Pop's Corn. I'd like to try the special blend coffee. Not only is it organic, but its fair trade. I'd like to try the peppermint mints. Their peanut butter Chocolate Cups looking very yummy. I have used their pet food and find it to be of high quality. I'd like to try the chocolate chip cookies. would love to try peanut butter cups - yum! I would like to try the Cinnamon Graham alphabet cookies! I want to try Ginger-O's Cookies, yum! I would like to try Newman's Espresso Dark Chocolate. I am a huge fan of Newman's Own! One product that I haven't tried is the Newman's Own Soy Crisps--the White Cheddar and Barbeque ones sound great! I'd love to try the Berry Blend dried fruit! The soy crisps look interesting I would love to try those! I'd like to try their Cafe Almond Biscotti. I would like to try the Ginger-Os. I'm a fan of Newman's Own Organics on Facebook as Erin A.-L. I would love to try the Vanilla Caramel coffee. I would love to try the chocolate chip cookies. I'd like to try the NELL'S A POPPIN'! I'd like to try the Fig Newman's, the peanut butter cups, lightly salted soy crisps and organic dried fruit\Pitted Prunes. I'd like to try the vodka sauce. Love to try the coffee. Thanks for the giveaway. I love the Newman O's in Peanut Butter and Mint flavors, so now I'd like to try them in the Chocolate flavor. I follow your feed on MyYahoo. Fig newman's but all their products are good. I'd LOVE to try the chocolate cups. Let's start with the hermits. The chocolate cups. What a great idea. I would like to try the Fig Newman's. I would like to try the Double Chocolate Chip Mint Champion Chip Cookies! I would like to try the chocolate cups. Would love to try Espresso Dark Chocolate. I like to try the chocolate cups. I would love to try the Fig Newmans. Thank you for the lovely giveaway. My cat would love to try the Turkey Canned Cat Food. I would like to to try the licorice. I am a fan of Newman's products but I would like the try the milk chocolate bars. I would like to try the Newman's French Roast coffee. I would like to try the pretzels. I would love to try peanut butter cups, thanks! The berry blend dried fruit looks tasty. I've heard the Newman's Own Peanut Butter Cups are amazing so I'd like to try those - although the Fig Newman's ROCK - I love them! I would like to try the Chocolate Cups! I would like to try the dark chocolate. I'd like to give our pet dog some of Newman's Own dog food. I think he'd really like it. I would love to try the dried berry blend.